1 serpent-head fish weighing about 300 g.
1 lemon grass stalk, cut diagonally into ½ inch-thick slices. Scale, clean and wash the serpent-head, and cut across the body into ½-inch-thick sliced. Put the water in a pot and bring to a boil. Put in the lemon grass, kaffir lime leaves and shallots. When it returns to a boil, put in fish. 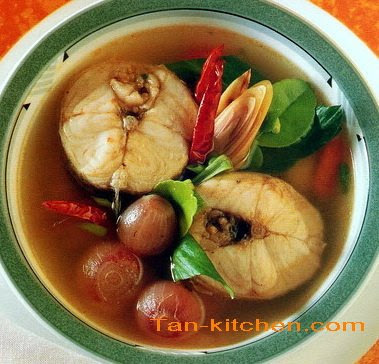 Season with the tamarind juice, lime juice and fish sauce. Add the spring shallots, eryngo and crisp fried dried not chilli, stir everything to gether and remove from the heat. Pour into a bowl. And serve.